Author: Gantos, Jack Set In . . .
From the Newbery Award–winning author of Dead End in Norvelt, this is a memoir about becoming a writer the hard way. A Printz Honor and Sibert Honor book. In Hole in My Life, this prizewinning author of over thirty books for young people confronts the period of struggle and confinement that marked the end of his own youth. 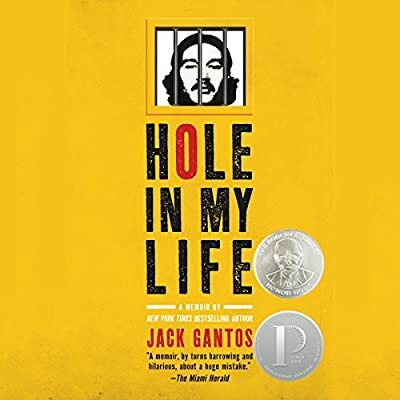 On the surface, the narrative tumbles from one crazed moment to the next as Gantos pieces together the story of his restless final year of high school, his short-lived career as a criminal, and his time in prison. But running just beneath the action is the story of how Gantos?once he was locked up in a small, yellow-walled cell?moved from wanting to be a writer to writing, and how dedicating himself more fully to the thing he most wanted to do helped him endure and ultimately overcome the worst experience of his life. Jack Gantos is an award-winning and New York Times bestselling author of books for readers of all ages, including Joey Pigza Swallowed the Key, a National Book Award Finalist, and Joey Pigza Loses Control, a Newbery Honor book. His book The Trouble in Me is an autobiographical novel about a fourteen-year-old Jack Gantos, and his book Dead End in Novelt won the Newbery Medal, the Scott O'Dell Award for historical fiction.